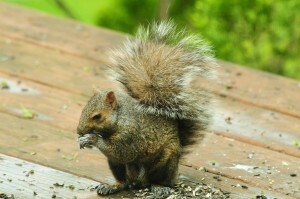 A few days ago, my local wildlife food store sent me an email offering in honor of National Squirrel Appreciation Day. I’d never heard of such a festive event, so I got online and learned that–according to the National Wildlife Federation– Squirrel Appreciation Day was started by Christy Hargrove, a wildlife rehabilitator from North Carolina. 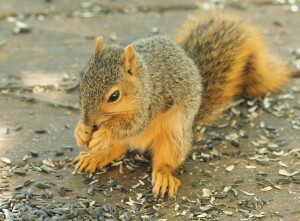 According to theultimateholidaysite.com, today is National Squirrel Appreciation Day! To give you an idea of how much I appreciate squirrels, every morning I make piles of sunflower seeds for my fuzzy pals. 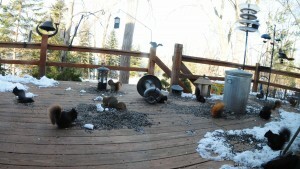 This is what my deck looks like most mornings. The record number of squirrels on our deck at one time is 15. 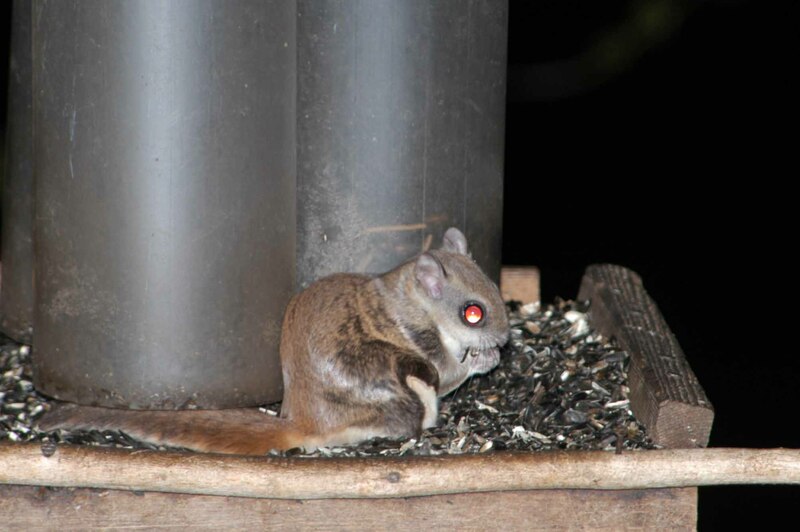 Over the years, all sorts of squirrels came to our deck to eat sunflower seeds, including this little guy, a flying squirrel. Flying squirrel that came to our feeders prior to my neighbor cutting his trees down. We also had a gray fella for a couple of years. 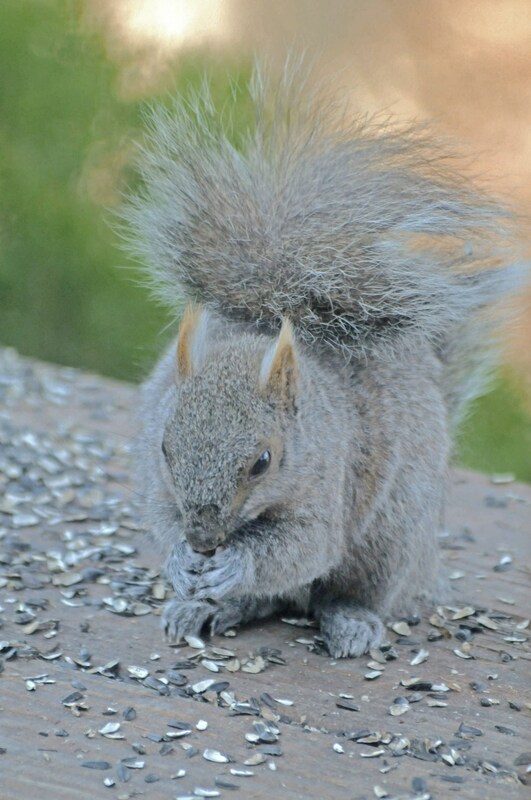 Gray squirrel with cute fuzzy brown ear tips. This fella has a little brown, a little gray. This fella is a mix of brown and gray. 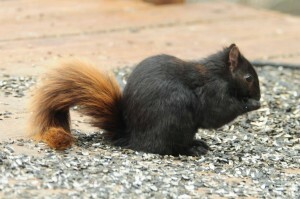 This squirrel is black with a reddish tail. The half and half squirrel. 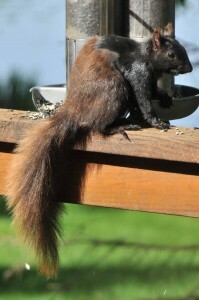 This squirrel is mostly brown but is shedding and seems to becoming mostly black. This one is a nifty mix of gray with brown. 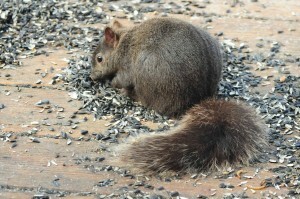 Black and gray squirrel eating seeds. This squirrel seems to have black, red and gray. 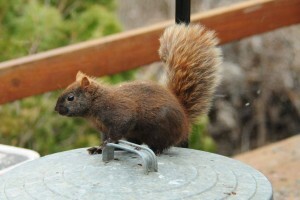 In addition to all the varieties of colors, we get squirrels of various sizes. 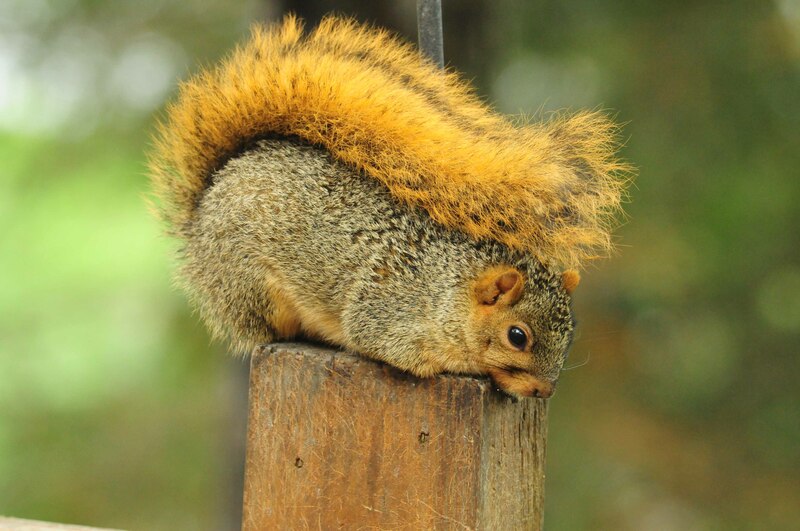 This young fox squirrel discovered the good life. 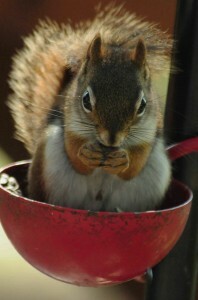 This red squirrel found it comfy eating from one of the bowls. 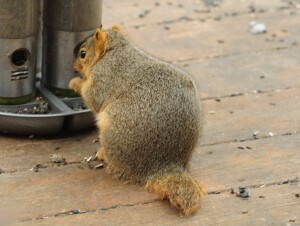 On the far extreme in size is this chubby squirrel. Squirrel with folds of chubbiness. 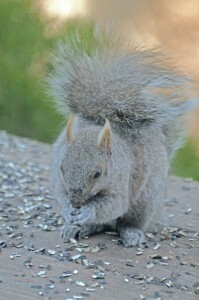 We feed squirrels with big fuzzy tails. Squirrel that looks like he was just groomed. And we have squirrels with hardly any tail at all. Fox squirrel that lost his tail somewhere along the line. 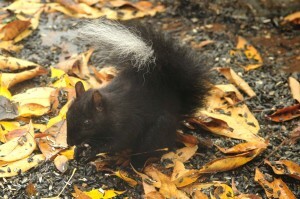 When this squirrel’s tail healed over, it turned white on the end. His tail looks like it was dipped in white paint. In addition to sunflower seeds, our squirrels also get an occasional salt-free peanut. Fox squirrel with a peanut. One day I put an orange on the deck. 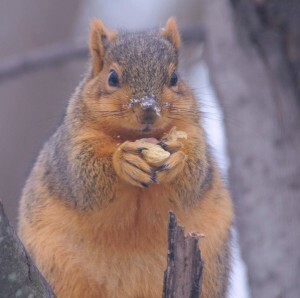 I’ve also taken photos of squirrels eating snow, cracked corn, and sap from our maple tree. 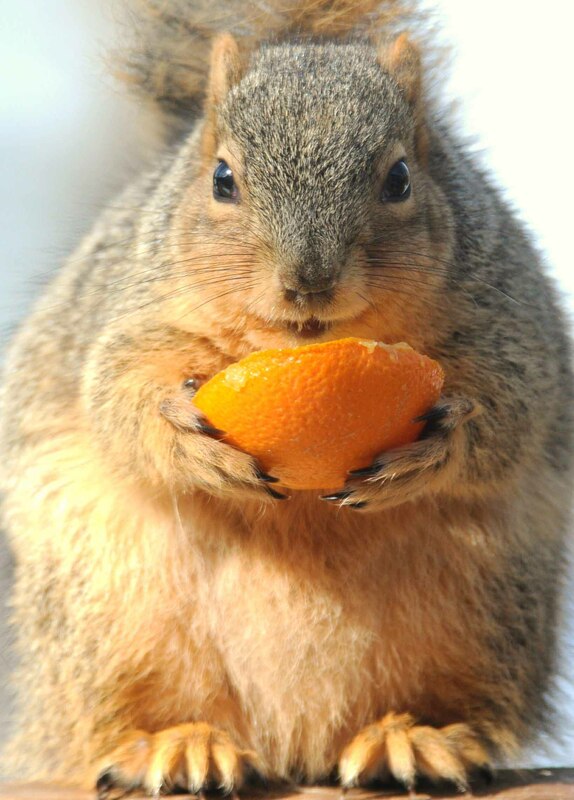 Whatever they eat, whatever they look like, whatever their size, I like all squirrels. 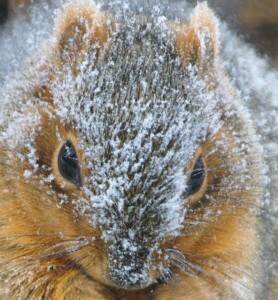 Close-up of a fox squirrel. 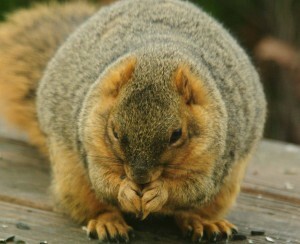 Happy Squirrel Appreciation Day all! I love these! Happy Squirrel Appreciation Day! I just LOVE!! all of your squirrel photos! Thank you so much for sharing them. I too love all squirrels–and I feed “mine” every day! I also go to my local parks and feed any and all that I see- I enjoy it so much ! I’m so glad to see others enjoy squirrels as much as we do. We have quite a selection in our Wheaton IL wooded lot but you have a few we have not seen, so cute! Our favorites had baby’s this year, I have been feeding them for 25 years and believe they know my quite well. So well in fact that the baby’s are not scared at all and let me get right up close for photos, which are on my other computer.